Five for Friday! 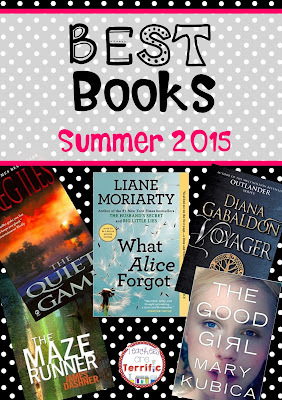 Books of the Summer! If you have followed me on this blog or Instagram you know I love to read! So this week's Five for Friday is devoted to that! It's my Books of the Summer List! Now, I know my followers are here looking for science-related posts and STEM ideas, but I am a reader and it is something I do just for me. We all need something to keep our sanity. I read. This summer I read a ton of great books and loved some of them. Here are the five I heartily recommend! This is the third book in the Outlander series. I have read this book a few times and listened to it a few times. When I found the series available on Audible.com I started from the beginning again! I listen to books when I do mindless chores like housework and when I exercise. The narrator of this series is spectacular. If you are not familiar with Outlander here's a brief background. Claire is visiting Scotland with her husband in the 1960's and finds herself at a standing stone circle. When she touches one of the stones she is thrown through time and awakens to the year 1743 in Scotland. Soon after she meets Jamie Fraser and soon after that must marry him to stay safe. It's quite an adventure and totally believable. It is well written, very historical, and my favorite books ever. Start with Outlander and work through all 8 books. This book was compared to books by John Grisham. It is a legal thriller and was a page-turner for me. It's the story of a lawyer, Penn Cage, who returns to his hometown in Mississippi and becomes embroiled in several hometown secrets and scandals. He encounters dishonest judges, corruption with the FBI, and even blackmail of his own family. There might even be a fire or two! It was a fun read. Oh my, I loved this book. Alice is in a spin class and blacks out. When she awakens she has forgotten the last ten years of her life, including the birth of three children. She also discovers her husband has filed for divorce. The rest of the book deals with her change in attitude and behavior after discovering she was a real b**** for the previous ten years. This was my favorite. It's the story of a kidnapping. Mia is meeting her boyfriend in a bar and when he doesn't show up she impulsively decides to go home with Colin, a stranger she has just met. After this one night stand, he takes her to a remote cabin and keeps her captive. It turns out her father is a prominent judge and the family has some pretty startling secrets. I was nearly at the end of this book, like two pages left when it seemed the story had been resolved. And then something happened that I completely did not see coming. Great ending. There you go Science friends- books you can try when you have a moment or two. Thanks for the suggestions! I will be reading The Good Girl soon as it sounds great! Thanks for visiting Angie! You will love the book you picked. It was totally believable and the ending caught me by surprise. I liked it much better than Gone Girl! Have a great weekend! What's Going on in Science Class? Hoop Flyers! A Unique Tower Challenge with Startling Results!